Did you know that July is National Blueberry Month? I had never known that until recently, but it makes total sense since blueberries are typically in-season during late June and early July here in the northeast. Today's guest post recipe is courtesy of the generous folks over at HUROM. (see disclosure). I love making homemade fruit smoothies and never tried adding these three fruits together. I'm going to give it a go this coming weekend. If you make just as they explain...I think it would be more of a fruit juice. I'm going to mix it up with some vanilla yogurt and ice cubes...to give it a good chill and thickness. Wash the pear thoroughly, and remove stem and seeds. Slice into appropriate sizes. Remove grapes from stem, and then wash grapes and blueberries thoroughly. 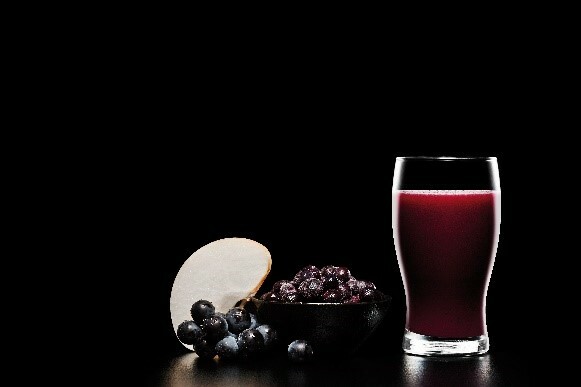 Add pear, grapes and blueberries to juicer. Enjoy! Pour over ice, if desired. Disclosure: This is a guest post. You can learn more about HUROM and grab more recipes by visiting the company's website online. This is a simple, but delicious recipe. I would love to make it soon.